Typhoon Haiyan, not the most devastating storm to hit Tacloban. Typhoon Haiyan, is the most powerful typhoon ever to hit land. 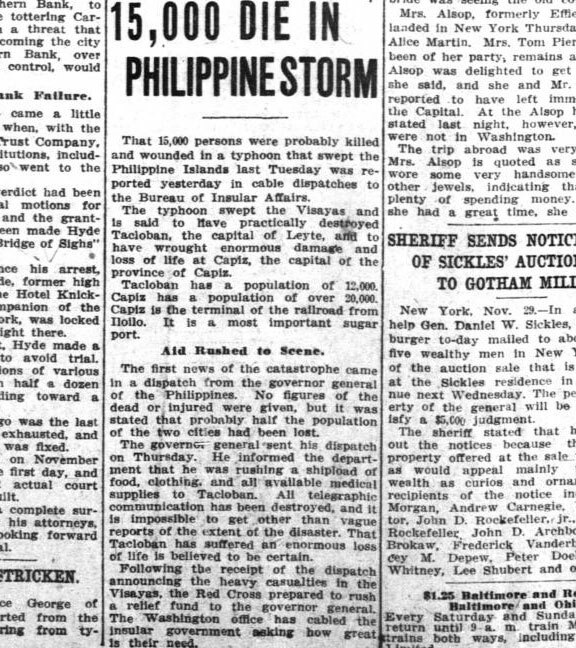 But did you know a more devastating storm hit Tacloban 101 years ago? On November 26, 1912, a powerful typhoon hit Visayas and killed approximately 15,000 in Tacloban and Capiz. That is about 50% of the population during that time. Here is a clip from The Washington Herald, dated November 30, 1912. That 15,000 persons were probably killed and wounded in a typhoon that swept the Philippine Islands last Tuesday was reported yesterday in Cable dispatches to the Bureau of Insular Affairs. The typhoon swept the Visayas and is said to have practically destroyed Tacloban, the capital of Leyte, and to have wrought enormous damage and loss of life at Capiz, the capital of the province of Capiz. Tacloban has a population of 12,000. Capiz has a population of over 20,000. Capiz is the terminal of the railroad from Iloilo. It is a most important sugar port. The first news of the catastrophe came in a dispatch from the governor general of the Philippines. No figures of the dead or injured were given, but it was stated that probably half the population of the two cities had been lost. The governor general sent his dispatch on Thursday. He informed the department that he was rushing a shipload of food, clothing, and all available medical supplies to Tacloban. All telegraphic communication has been destroyed, and it is impossible to get other than vague reports of the extent of the disaster. That tacloban has suffered an enormouse loss of life is believed to be certain. Following the receipt of the dispatch announcing the heavy casualties in the Visayas, the Red Cross prepared to rush a relief fund to the governor general. The Washington office has cabled the insular govermnet asking how great is their need.